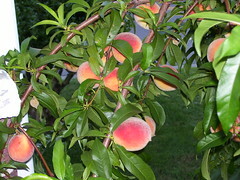 Posted on July 18, 2006 | Comments Off on Peaches getting ripe! The peaches are smaller this summer, but they are getting ripe. The mockingbirds that hatched in the holly tree nearby are sure that they own this tree also, so I will have to fight for some of the peaches.